Sometime last week, Ann got an e-mail from MovieTickets.com about a free, pre-release screening of a DreamWorks movie “from the people who brought you Kung Fu Panda and Madagascar.” So being we had nothing to do today and it was free, we went ahead and signed up to go. Unlike most movie screenings, this one wasn’t in Hollywood but in beautiful, downtown Brea. (I’m being facetious, folks.) Had we known there wasn’t a freeway close to the damn city so we would have taken the streets to the place, which is exactly what we did on the way home. When we arrived, there was already a group of people waiting to get in since seating was on a first-come, first-served basis. While waiting outside the theater, people from the Nielsen survey company gave us questionnaires asking us about our movie viewing habits: what we’d seen, what we’d want to see, if we prefer 3D or traditional, etc. We also got wristbands upon entry to show the rest of the moviegoers we were more specialer than they were. Remember that this was a first screening so it was serious business and as such, extensive security measures were taken, including all participants having to walk through a metal detector. There was also a guy in the theater with night vision binoculars so he could spy on the audience while the movie was showing. His stoicism and appearance reminded us of Crazy Steve from Drake and Josh, a guy that could go off at any second and for any reason. Once picked, they took the names of everybody in the group and from the looks of it, they already knew who they wanted to talk to: families of four with a boy of at least 8 years of age, so unfortunately we didn’t make the cut. That’s too bad because I would have liked to give them some input. Finally, once all the seats were filled and interviewees finalized, the title was revealed: How to Train Your Dragon, yet another movie based on a children’s book, because Lord knows we haven’t had enough of those lately. SPOILER ALERT! If you don’t want to know more about the movie, don’t read beyond this point! I know I’ve dragged this one long enough up to now, so let’s get to the point. Not to give up too much of the movie’s story, here’s what I took away from it. Just remember that your ol’ pal Dave has studied screenwriting and understands the formula a little more than Joe Moviegoer. There is some humor but not enough. Thankfully, the story didn’t lend itself to the timely, topical humor that DreamWorks has relied on for so many movies and is outdated by the time it’s released. If you like a lot of Vikings and dragons, this movie is for you. DreamWorks loves the classic underdog/outcast-saves-the-day/buddy story. It was predictable at times. In fact, I could have sworn some of Hiccup’s lines were ripped right from Shrek and man, I totally saw what was going to happen in one of the final scenes. Did I mention all those Vikings and dragons? The pacing was slow at times. There was a real soundtrack and score, not a bunch of Top 40/pop songs. The playful Toothless will remind you of a puppy and definitely bring a smile to your face. About 2/3 into the movie, Anthony wanted to go home which was a good indication that it wasn’t keeping his attention. He did the same thing for Monsters vs. Aliens but loved Mr. Bean’s Holiday–go figure. But he wasn’t the only one who wasn’t that impressed: the family next to us left about 20 minutes into the movie. We were given yet another questionnaire afterward and yep, I was pretty thorough in my opinion of the movie. Overall, it seemed a bit too long and there were a few scenes I think could have been deleted since they didn’t really move the story along. Even so, chances are I would see it once it’s released to the general public because a) it will be in 3D, and b) I’d love to see what made the final cut. And my disappointment for not being picked for a post-movie interview was all for naught as I overheard one of the Nielsen people tell one of the families that the interviews were canceled. Remember when I said I thought it was too long? Well, there was another screening about 30 minutes after this one so I’m guessing there wasn’t time to get in-depth opinions. With a little work, I think this movie could be much better but as for now, it was good…just not excellent, like the first Shrek movie. So there’s my opinion. 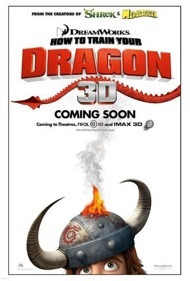 At any rate, here’s the trailer for How to Train Your Dragon, due in March 2010. This entry was posted in Children, Commentary/Opinion, Entertainment, Life, Movies and tagged dreamworks, hollywood, how to train your dragon, Movies, screening by Dave. Bookmark the permalink.